This entry was posted on July 30, 2018 at 5:57 am and is filed under Music, art, theater, Transit. You can follow any responses to this entry through the RSS 2.0 feed. You can leave a response, or trackback from your own site. I went into NYC by train a couple of months ago. Up from NJ & into Penn Station. The tunnels into the city struck me as odd. I’m not quite sure what I was expecting… what I know of NYC comes from TV, movies, friends stories & this blog. Friendly people, tall buildings, the Staten Island ferry ride, on the subway, a stop at the hole where the Twin Towers used to be, hot dogs & pizza then back on the train for our ride back to the RV down the coast a bit in NJ. Poor Mr. Hopper. Anxious, alienated, isolated. Washed out yellows and blank walls was his world. The thought of being with his fellow creatures produced dread rather than excitement. He didn’t seem to enjoy being asked to explain his work either. I’m going to Photoshop glitter on some of his paintings and see if that helps. There is a certain apprehension as you get closer to the city. More like excitement, like when I reached the bridges on the Subway. I remember always staring at the tenement buildings and wondering about the people/families in them. Even looking at the Ghost signs on the sides of the buildings and finding them fascinating. If you look at every historic style of building, the white as old, the red as mid-recent, the brown as newer and soaring up to the sky, you have no choice but to flee underground and away from the madness that is now. Goodbye to that! Reactions to art can vary; “correct” responses? They vary too. Looking at this painting plunges me into the deepest of depressions. 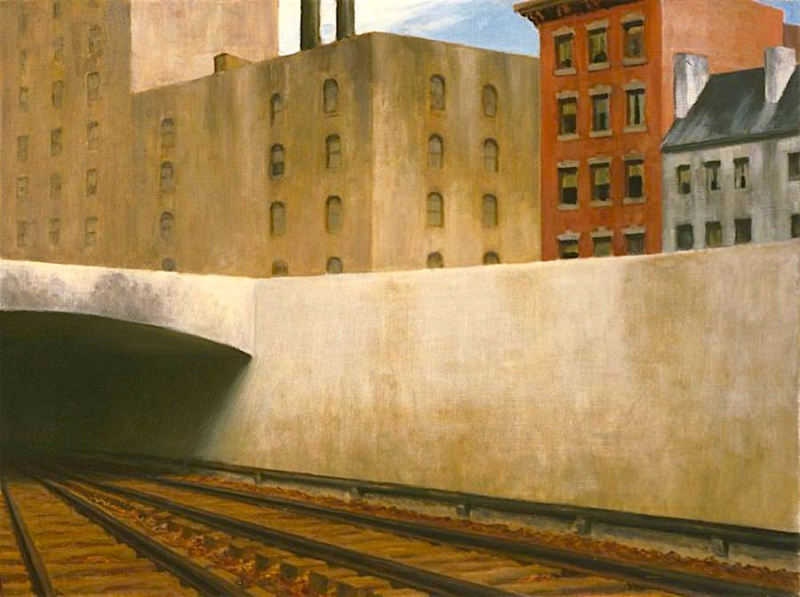 But then, most of Hopper’s attempt at art do so. Maybe that was his intent. This HAS to be the entrance to the tunnel at 96th Street and Park Avenue. The buildings haven’t changed. There is no open cut like this anywhere else. And it’s about a train not subway so the Metro North south of 125. When you arrive you climb up into hyper busy Grand Central. One of the most life affirming places I know. Yes, this appears to be the view from today’s Metro North train traveling south. I’ve always gotten excited and happy on approaching a city. My one time entering NYC by train was scary. Half way through the tunnel the train stopped for several minutes. They announced the track was blocked so we had to back up. Before we got back out the issue was fixed, so we started going forward again. Spending a lot of time under the Hudson River can raise your “fear and anxiety.” I was glad to see the great City as we came out of the tunnel. Here’s a great site that illustrates Hopper’s influence on Hitchcock films.